There’s a reason why lighting designers are turning to our Zircon filters for their LEDs. It’s because they’ve been specifically designed to fine-tune the inconsistencies often associated with LED lighting, ensuring your LEDs give the same performance, time and time again. Watch the video to learn why it's so special. LED lighting has many benefits, but one of its stumbling blocks is that its intensity can contribute to the fade times of standard lighting filters. In order to overcome this our Research and Development team has developed a new way of producing filters that ensures they last longer when used with LED lights. after as much as 8 months. Contains 9 Zircon sheets 300mm x 300mm (12" x 12"), thickness 180 microns. Contains 12 Zircon sheets 300mm x 300mm (12" x 12"), thickness 180 microns. Contains 14 Zircon sheets 300mm x 300mm (12" x 12"), thickness 180 microns. 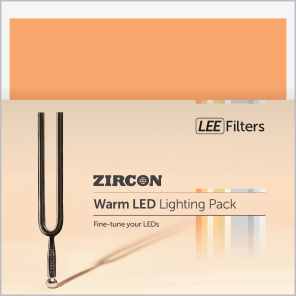 The Zircon Warm Amber filters correct and warm up a range of different colour temperature white LED's. Longer life filter for major warm up correction of cool white LED. Example: 5500K LED to 3000K. Colour Temperature shift varies with type of LED. This dichroic glass filter is a close match. LEE dichroic glass filters offer unrivalled colour purity, stability and longevity. Longer life filter for medium warm up correction of white LED. Example: 4000K LED to 3000K. Longer life filter for medium warm up correction of white LED with minus green tint. Example: 4000K LED to 2900K. Longer life filter for correction of warm white LED. Example: 3500K LED to 3000K. 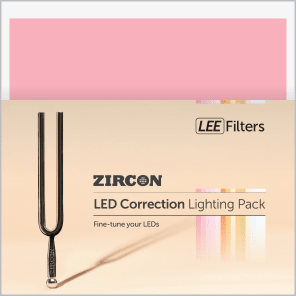 Longer life filter for fine correction of warm white LED. Example: 3000K LED to 2700K. Longer life filter for fine warm up and minus green correction of warm white LED. Example: 3000K LED to 2600K. The Zircon Cool Blue filters cool down the colour of warm white LEDs. Longer life filter used to cool down the colour of warm white LEDs so that they look whiter. Example: 3000K LED to 3500K. Longer life filter used to slightly cool down the colour of warm white LEDs so that they look whiter. Example: 2700K LED to 3000K. Longer life filter used to very slightly cool down the colour of warm white LEDs, allowing different batches of LEDs to be used together. Example: 3000K LED to 3200K. There is not dichroic filter that's a close match to this colourThis dichroic glass filter is a close match. LEE dichroic glass filters offer unrivalled colour purity, stability and longevity. 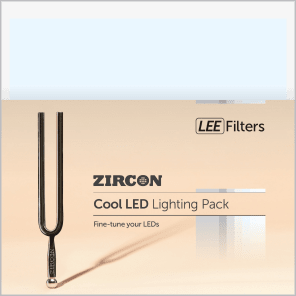 The Zircon Diffusion filters offer different strengths of diffusion specifically designed for LEDs. Strongest diffusion on thick polyester for easy use on panels and in channels. Can be used close to LED chip to blur the pixels. May cause a slight change of Colour Temperature on some LEDs. 216White DiffusionA strong diffusion used for soft light effects. Manufactured on a tough Polyester base in a range of seven strengths. This standard polyester filter offers a similar level of diffusion. Strong diffusion on thick polyester for easy use on panels and in channels. Can be used close to LED chip to provide some blurring of the pixels. May cause a change of Colour Temperature on some LEDs. 416Three Quarter White DiffusionA strong to medium diffusion used for soft light effects. Manufactured on a tough Polyester base in a range of seven strengths. Medium diffusion on thick polyester for easy use on panels and in channels. Provides reasonable diffusion properties without too much loss of light. 250Half White DiffusionA medium diffusion used for soft light effects. Manufactured on a tough Polyester base in a range of seven strengths. The Zircon Minus Green filters remove the green casts often associated with LED Lighting when using a digital camera. Longer life filter for use by photographers to remove large green casts produced by some LEDs. Longer life filter for use by photographers to remove medium green casts produced by some LEDs. LD279Eighth Minus GreenProvides a very slight pink cast. Longer life filter for use by photographers to remove tint green casts produced by some LEDs. The Zircon Density filters provide a controlled reduction in the light level of LEDs. Longer life filter for LED fixtures, used to reduce the light level by approximately 80%. There may be a slight warming-up of the colour when used on some LED lamps. Longer life filter for LED fixtures, used to reduce the light level by approximately 60%. Longer life filter for LED fixtures, used to reduce the light level by approximately 40%. LEE dichroic glass filters offer unrivalled colour purity, stability and longevity. However, there are no close matches to this filter in the range. This Zircon Density filter is used to block UV and blue light. Longer life filter used to block UV and blue light. Has an optical density above 4 in the UV and visible up to 470nm.